ElBaradei for president: What went wrong? Hundreds gathered at the Journalists' Syndicate on Saturday to meet former head of the International Atomic Energy Agency (IAEA) Mohamed ElBaradei and attend the official launch of his new party, the Constitution. Greeted by thunderous applause and lively chants, ElBaradei entered the conference hall, which was drapped in banners bearing his image and the party's name, squeezed between three of the conference organisers, doubling as bodyguards. Eager to take part in the launching of the already popular party, hundreds shoved and fought to enter, but many were left outside as security quickly locked the syndicate's gates to prevent people from flooding in and stampeding. Inside, the hall was fully packed with crowds occupying every possible inch, including the stairs. 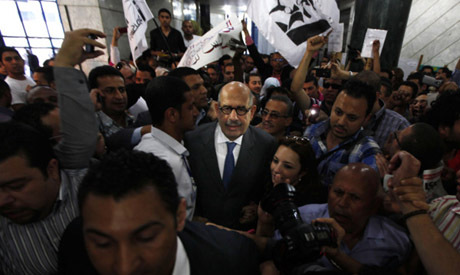 Several chants referred to ElBaradei as "The captain of the ship." On stage, ElBaradei sat with several founding members, including prominent legal expert Hossam Eissa, author Alaa El-Aswani, activist Ahmed Harara, talkshow host and activist Gamila Ismail, civil society consultant Hala Shukrallah and ambassador Sayed El-Masry. The figures all represented the camp that, in the March referendum, had pushed for the constitution to first be established before presidential elections. They lost that battle, however, and the country went on a different course than they wished. A new roadmap was what most of the speakers stressed as the main aim of the new party; one that would guarantee a representative constitution. Criticizing the current period as "lawless," ElBaradei explained that had the transition period been properly managed, there would have been no need for this party. The current management of the transition period has left Egypt with a parliament whose legitimacy is in doubt, a frozen constituent assembly and a president that will take his seat with no stated authorities. That's precisely what created the need for this new party, stated ElBaradei. "The constitution is for all Egyptians, left and right" chanted the audience. "Down with military rule" and "Egypt is a civil state, not a religious state or a military state," they further chanted. In a highly emotionally-charged atmosphere ElBaradei quickly shifted the talk in order to honour several revolutionary figures. "We stand to honour the hero, Ahmed Harara, who is here with us today," said El-Baradei as everyone stood to applaud the revolutionary symbol that lost his first eye during the 18-day uprising that ousted Hosni Mubarak and his second eye during clashes with police in November. ElBaradei further honoured the face of the January 25 Revolution and one of its triggers, Khaled Said, the 28-year-old who was killed by police in Alexandria in 2010. Said's mother, who was standing in the centre of the hall, was quickly surrounded by many youth in another show of respect. "Muslims and Christians one hand" shouted the crowds when ElBaradei mentioned Mina Daniel, who was killed by military tanks in November during a pro-Coptic Christian rights protest. In his speech, Harara explained: "I decided to become a member of this party hoping to create networks between us and between all the civil society initiatives to achieve the civil, democratic state we aim for." "The aim of this party is to rebuild the structure that would allow for a better democratic transition, in contrast to the current lawlessness, mistrust, illegitimacy and doubt between the different factions," further stated ElBaradei. According to prominent lawyer, Eissa, the group believes the constitution should have come first to guarantee the desired democratic transition. When asked about the presidential elections, Eissa stated the party will not back a candidate, but will leave it up to its members to decide. In January, ElBaradei withdrew from the presidential race, arguing that there can be no fair elections without democratic structures. In his withdrawal statement, he also condemned the order chosen for Egypt’s transition period (the presidential elections first and then the constitution) and the oppressive methods that were in use, including trying civilians in military courts. Famous leftist poet, Ahmed Fouad Negm, finally took the stage to recite one of his known revolutionary works. Although he wrote it in the seventies, it was repeatedly sung by many of the youth who participated in the January 25 Revolution. Referring to Negm as a leftist symbol, Eissa further stressed that this party aimed to represent all, right and left, to create a front for Egypt's revolutionary movement. Although the party has yet to reveal or even formulate any of its missions, it claims it offers a platform for all the different factions of Egyptians. While the speakers did say the party aimed for a better roadmap and a "proper" democratic transition, they did not specify how they would do that. In her speech, Gamila Ismail, further stressed "this is not ElBaradei's party; this is the party of all Egyptians." "Hold your head up high; you are Egyptian" chanted the audience as the speakers prepared to exit the hall.